The N1000 Series Encoders and Decoders are an affordable local AV-over-IP switching solution that packetizes video into a minimally compressed IP format that provides excellent video quality at low latencies. 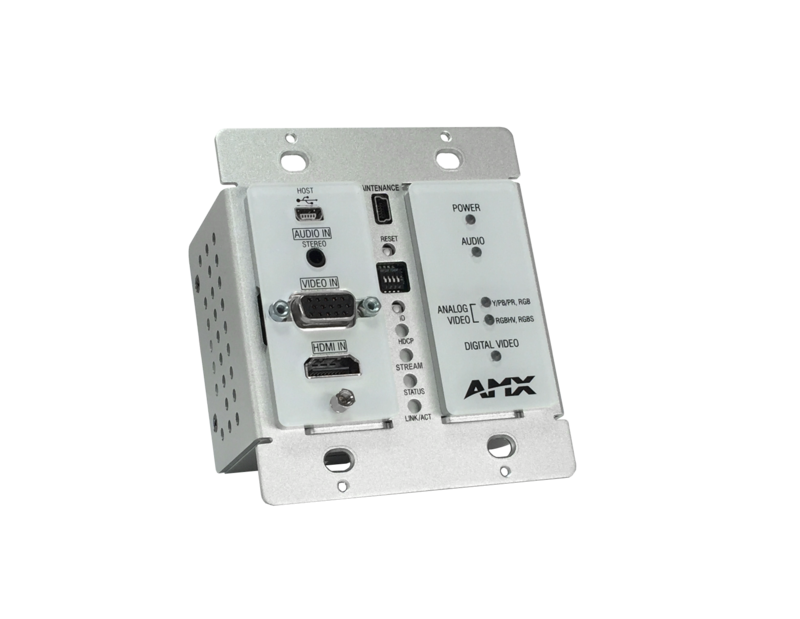 This compression is perfect for point-to-point video distribution, small 2x1 switching applications, and larger switching applications (for example, 32x32), all using off-the-shelf layer-3 network switches. 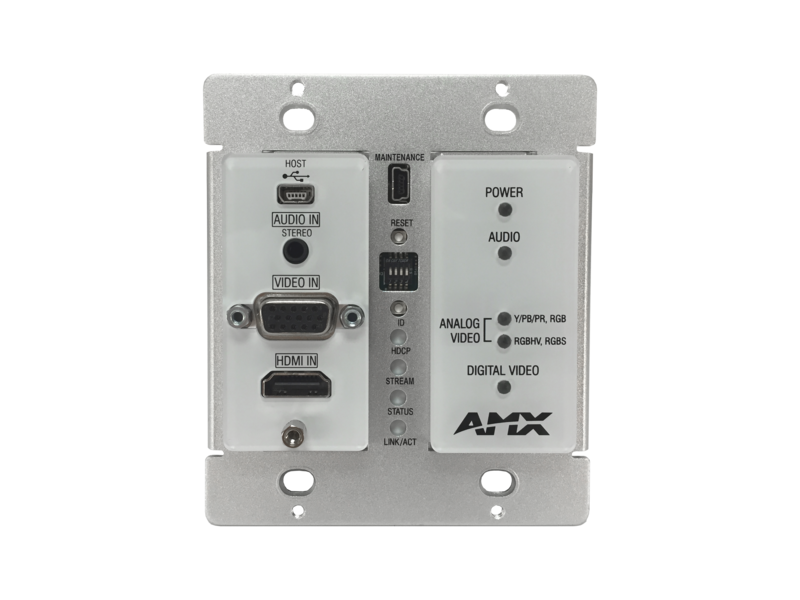 The NMX-ENC-N1115-WP provides the excellent encoding capabilities of the NMX-ENC-N1133 in a 2-gang wallplate format. 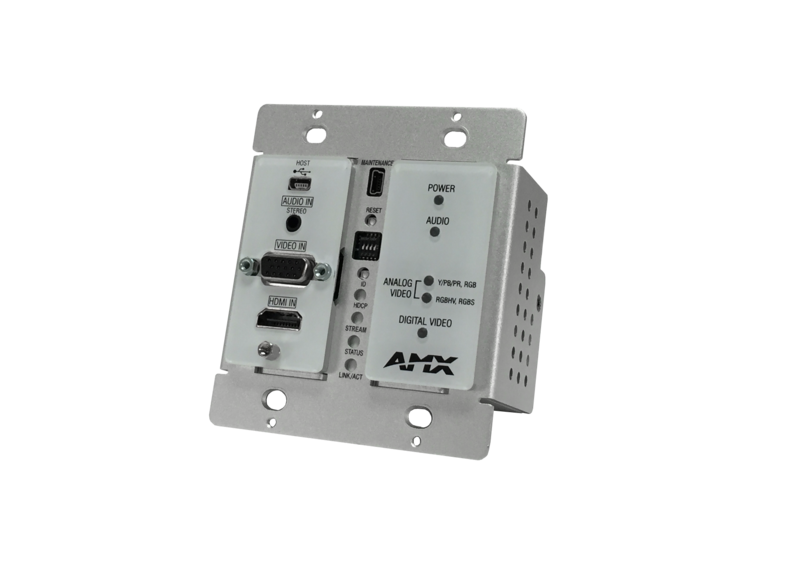 This encoder can be easily mounted in a wall, lectern, or floor box using a standard 2-gang US back box, and connected to power and Ethernet using only a single category cable. Sub-Frame Latency – Combined encode and decode latency of 10 ms at 60 fps. Wallplate Form Factor – Fits conveniently into a 2-gang US back box for easy installation in a wall, floor, or lectern. Unmatched Flexibility – Build point-to-point links, simple 2x1 switches, or cost-effective matrices up to 32x32. Output Resolutions: Matched to inputs. NOTE: The N1115-WP does not accept Composite or S-Video (YC). *These signal types are supported through a passive adapter. Note: Scaling adds one frame of latency (17ms at 60fps). AUDIO LED: On (green) when audio is transmitting. ANALOG VIDEO LEDs: On (green) when analog source is available and transmitting. STATUS LED: Flashing (green) when the unit is active. LINK/ACT LED: Flashing (yellow) when network traffic is being sent or received. 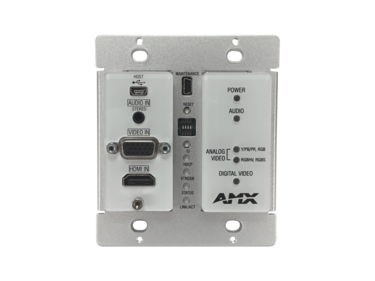 Point-to-point applications between the encoder and a decoder requires a PoE injector to power the wallplate encoder. Note: In order for the unit to receive Power over Ethernet (PoE), it must be connected to a switch or other equipment that has a PoE PSE (Power Sourcing Equipment) port. Warning: Do not run wiring that is connected to a PoE PSE port outside of the building where the PSE resides. It is for intra-building use only.